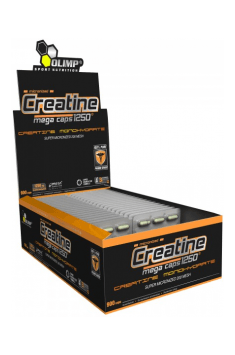 Creatine Mega Caps 30 caps. Take one portion (4 capsules) immediately after waking up, the second portion (4 capsules) immediately after training. Take one portion (4 capsules) immediately after waking up, the second portion (optional) in the spaces of a few hours, between meals. The preparation is dedicated to people who practice sport regularly and to elderly people, who as a result of tendons and joints strain and their weakening, may suffer from damages and injuries. Supplement increasing the level of testosterone. It supports the construction of muscle mass and limits estrogen level. The highest-quality source of BCAA in the proportion 2:1:1 enriched in glutamine and vitamin B6.